Now, where I have been? Well, since my last post two friggin’ weeks ago already, I have gone through three distinct phases that have completely and totally removed me from all things blogging. First, there was pre-vacation panic. This is where I run around like a chicken with it’s head cut off making sure everything is just so before we leave. I do this, of course, so I can relax. I make myself crazy so I can relax. Is that weird? That may be weird… The house must be spotless. There must be nothing left in the fridge that may rot. I have to lay out my entire wardrobe just so I can select 10 or so outfits to cover my bare bottom while we travel. I have to pack the snacks. And assemble the rockin’ road trip tunes. And make sure the mail is being held and the newspaper is canceled and that there are timers on all the lights. Getting ready to go on vacation is downright exhausting, I tell you what! Second, well, we went on vacation! There’s no blogging on vacation. Only sightseeing and eating and spending time with the Hubs are allowed. Ahhhh. We spent five relaxing days in FABULOUS Nashville, TN. We had an AWESOME time. LOVED it. Like the “I would drop everything right now and move there” kind of love. I am ever so slowly working on a post about all the great things we saw and ate while we were there. It will be up soon…I promise! I’ve been working on it since last Wednesday…sometimes you just know when it’s time to take a step back and move on to something else for a while. This is one of those times. That’s why you’ll see an (unusual and fun) recipe in this post to pump you up for what’s coming. So stayed tuned! And, third, there’s the Back from Vacation Blahs. You know how you get all tired and cranky that it’s back to reality? Laundry. Restocking that fridge you raked clean. Getting back into the swing of things at work. Add in the fact that two days after we returned it was back into the car for a weekend in the Chicago ‘burbs to see some of my wonderful, fabulous friends! Whew! Needless to say, the blog has fallen by the wayside while I was off gallivanting around. Here is a really fun and easy recipe to get back into the swing of things…. Now, not to give too much away about our vacation, but one of the best things we did was drive down to Lynchburg to the Jack Daniel’s distillery. What fun! A of all…it’s gorgeous country down there. The town is nestled into wooded hills. It’s tiny, but absolutely beautiful. And with the leaves just beginning to turn, it kind of makes you forget that you are really not all that far from the big city. B of all…it’s Jack Daniel’s – what’s not to love about that?! The whiskey making process is a long and labor intensive one – Our tour guide said that at any given time, there are upwards of 70 MILLION gallons of whiskey being aged in the barrel houses. 70 Million!! Now THAT’S a lot of booze. The county in which the distillery is located is actually dry. The only place you can buy liquor is on the property and they only started allowing that about 15 years ago! That’s just fascinating – the county’s economy revolves around the production of alcohol…and you can’t even buy it there! Of course, we picked up our own bottle of Tennessee whiskey while we were there. That’s a given. After we finished our tour, we headed into town to poke around in the shops on Main St. Who can resist small town shops? I know I can’t. I promptly dropped 60 bucks there. Ha. One of the souvenirs I picked up was a cookbook – Jack Daniel’s Spirit of Tennessee Cookbook. Eric may talk a big game that he’s Whiskey Bent and Hell Bound (ha) but he will totally NOT drink all that anytime soon. Figured I’d help him along and use some of that amber-colored deliciousness in some recipes. As I was leafing through it, I knew what I had to try first – as in pretty much the minute we returned…. What the heck is a Snockerdoodle? Well, it’s a delightful chocolate cookie that starts with boxed cake mix (I know, I know…but like I said, this is a ridiculously easy cookie) and gets a little flavor help from Uncle Jack (Daniel, that is.) 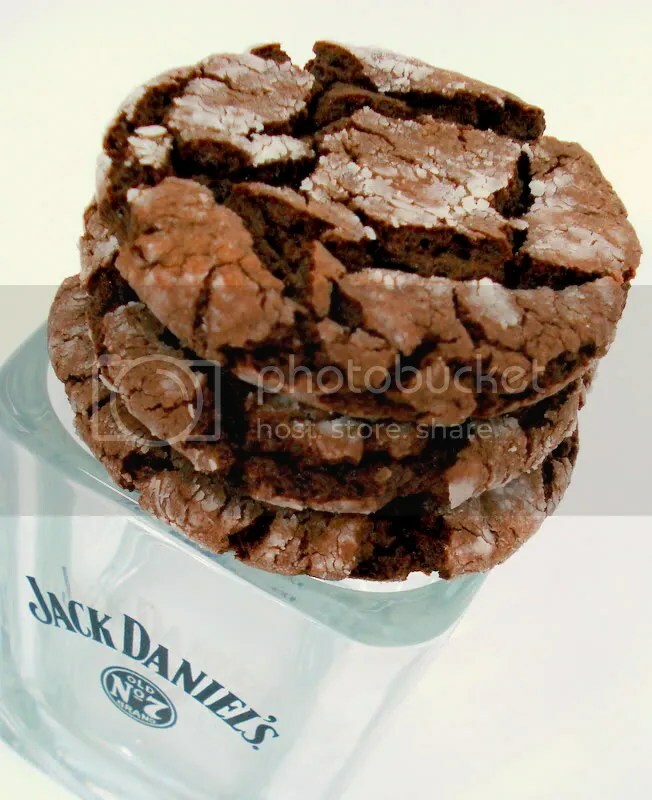 Yup, this is a chocolate WHISKEY cookie. Get it? SNOCKERdoodles. LOVE it. These are SO good. The end result is a chewy cookie with a rich, dark chocolate flavor and a warm, spicy background from the whiskey. The flavor is so unexpected but totally delicious. The whiskey is not overpowering at all. These would be an excellent addition to a holiday treat tray. You know…after you’ve spent days and days and countless hours kneading, rolling, cutting, and decorating Christmas cookies but you still need just ONE MORE thing to round out your baking? These. Seriously. They take minutes to throw together and they will totally impress your friends. Preheat oven to 350 degrees. Blend eggs and oil. Add cake mix and whiskey. Mix well. (I used my hand mixer). Form into small balls and roll in powdered sugar before baking. Place cookie balls on ungreased cookie sheet. Bake for 10 to 15 minutes (check ’em after 10). Be careful not to overbake – cookies will soft when taken out of the oven. Makes 5 dozen. Chocolate Chip Oatmeal Cookies – My grandma’s recipe. A true family favorite of ours. Lemon Chicken with Croutons – This is a GREAT way to make a whole chicken. So delicious. This recipe looks great. I like the idea of the whiskey inside. You forgot to mention the sip of whiskey that you must take while making these! What a beautiful photo, it caught my eye on tastespotting, and what a great trip. I will put that on my must see list. We are going to Gatlinburg in December, but won’t have time to stop by this time around. Thanks for sharing your wonderful trip! SNOCKERdoodles!! Hysterical! Love them, and must make them. Do you love that Jack is made in a dry county? Welcome Back! 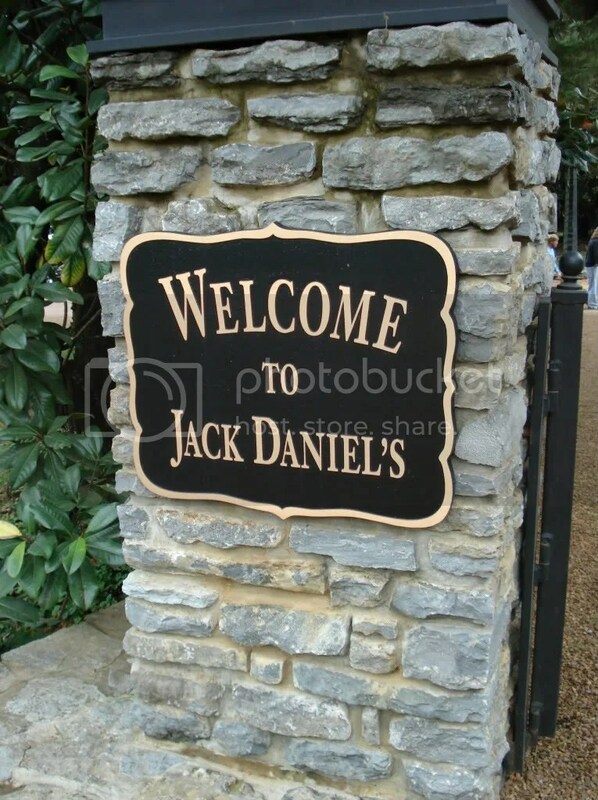 We lived in Nashville for 4 years and I never made it to the Jack Daniels distillery. DH went once, but I never went. I am so trying these as soon as I get a cake mix. I see a trip to the grocery store tonight! Your trip sounds amazing!! I’ve been visiting your site and bookmarking recipes so that I can learn to cook. I love how you make cooking sound so easy and fun. It’s intimidating to me, but your passion for food and people makes me want to learn. I’m blessed that I get to be on the receiving end of some of the delicious goodies 🙂 Keep writing, Honey! I mixed up as directed but still end up with a cake-ish batter that can’t be rolled into balls… was this supposed to be chilled? Sorry the dough didn’t come together like it’s supposed to! I have not had a similar problem, but I think popping it in the fridge for a while would for sure help it firm up a bit. Otherwise, maybe try adding a bit of the powdered sugar (couple tablespoons) to the dough. Hope that helps!